The repo industry is involved in the business of repossession. When consumers default on a loan, such as a car loan, then a lien on that item can be activated. The consumer can be ordered to turn the product over because of the lien. Most owners refuse to do so. That’s where the repo industry steps in to help. It often focuses on the legal remedy that is called “replevin” in markets where self-help repossession is not allowed or cannot be completed safely. The repo industry can also help owns recover items that they may have leased or rented to others. If an item was borrowed, with or without permission or compensation, it may be possible to repossess that item as well. In times of economic difficulty, the repo industry tends to grow. In stronger economies, the repo industry still grows as well. Delinquencies and defaults are a common way of life for consumers, especially in the United States. In the United States, the repo industry is bound by laws that require a breach of the peace to not occur during the repossession of property. If the peace is disturbed, then the repossession will be reversed and those involved will be liable for damages, which may include the lienholder. All 50 states allow some version of a repossession to occur if a debtor is in default and a breach of the peace does not occur. Just because a repossession order comes through does not guarantee a repo occurs. In the peak year of 2009, when 1.9 automobile repos were successfully handled, there were 3.1 million orders issued. 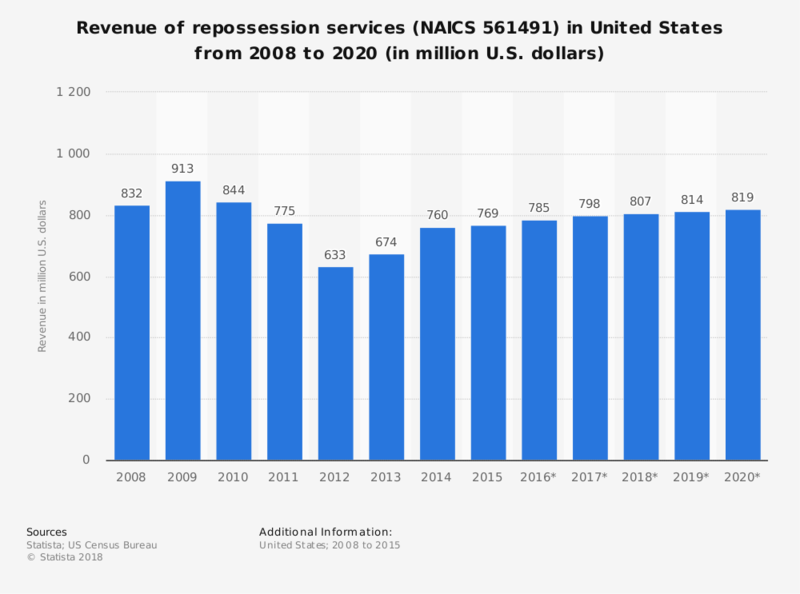 As debts continue to rise once again, the opportunities for repossession services to be required will also rise. It creates a difficult position for consumers, as they may be responsible for a debt balance, even after the repossession occurs. For that reason, it Is important to be in discussions with a lienholder immediately if a payment will be past due. Otherwise, the repo men may come calling.